Matt Pearson’s second goal in two games sealed a battling 1-0 win for FC Halifax Town at bottom club Telford. 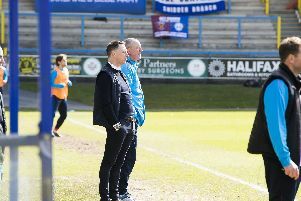 Town had better get used to Tuesday night football the way their fixture list is shaping up, and this was a testing trip against a Telford side rejuvenated under former Guiseley boss Steve Kittrick. It wasn’t pretty, but this is the kind of win Town may look back on as particularly significant should they finish in the top-five. That possibility is a small step closer thanks to this win, as Town made the most of one of their games-in-hand. Kittrick has known some battles with Halifax down the years. He had lost only one of his six games in charge before tonight and the work rate displayed by his side showed he’s clearly had a positive effect since taking charge last month. It’s been anything but home sweet home for Telford, who have the worst home record in the league, while their 4-0 defeat at Fylde in the FA Trophy was certainly a spanner in the works. But if Town needed any clues of the potential dangers a club in the drop zone can pose, Saturday’s draw at Dartford was a timely reminder. Scott McManus went closest in the early stages with a low shot off target, but Telford offered enough of a threat to suggest their position at the foot of the table would bear little meaning on the contest. The enforced early departure of Adam Smith to injury didn’t help Town either, with Richard Peniket moving out wide to accommodate Scott Boden. Danny Schofield and Will Hatfield dovetailed nicely in the middle third, while Telford buzzed around like a side imbued with the feel-good factor of a relatively new manager. This was certainly a different side to the one who capitulated 5-0 at the Shay earlier this season. Former Chester forward Tony Gray worked hard off the ball and offered plenty of inventiveness off it, while six-foot-plus striker Sam Smith kept Marc Roberts and Steve Williams busy. The hosts seemed to be building a head of steam as half-time approached, with Andy Todd producing a fine run and shot which Matt Glennon saved at his near post. From the resulting corner, Adam Farrell fizzed a cross through a crowded box that somehow evaded a goal-ward touch. Schofield recorded Town’s first effort on target shortly before the interval with a shot from outside the area after some excellent control to bring down a high ball. The 34-year-old had been the stand-out performer in red in the opening half with some timely interceptions and offering calming influence in midfield. But Telford belied their bottom-of-the-table status with an impressive first-half, with the general consensus among the home supporters of an improved brand of football under Kittrick looking justified. Schofield continued to impress after the restart with a surging run and low shot which Freddie Hall dealt with comfortably, while Peniket had a similar effort minutes later as Town more incisive going forward. They capped their bright start to the second-half with Pearson’s goal, as he tapped in Schofield’s corner via a delightful back-flick by Marc Roberts. The Town skipper produced an equally impressive touch in the other box moments later to send a dangerous cross from Farrell back where it came. Telford’s response was commendable though, with Ben McLaughlin and Gray both seeing curling shots drift just off target. There were echoes of Dartford at the weekend as Town were pushed back and forced into some dogged defending, but they stood up well, with Kevin Roberts particularly excelling with some crucial blocks and interceptions. A quick Town break saw them create two chances to seal the win, but the Telford keeper produced two superb saves to deny Peniket and Boden, who then saw a header saved moments later. Substitute Sam Hillhouse came close to his first senior goal with a prod that rolled just wide from Schofield’s free-kick. It really was starting to resemble the grandstand finish of Saturday now when Gray’s looping header hit the bar less than a minute later. Telford: Hall, Disney, Byrne, Grogan, McLaughlin, Poku, Rea (Ventre 10), Smith (Hancock 90), Todd (Owens 72), Gray, Farrell. Subs not used: Hedge, Matthews. Halifax: Glennon, K Roberts, M Roberts, Williams, McManus, Schofield, Smith (Boden 12), Pearson, Hatfield, Jackson (Marshall 46) (Hillhouse 81), Peniket. Subs not used: Senior, Killock.